We are now full swing into hurricane season and we are sitting here on Rode Trip with our fingers crossed that none come our way. 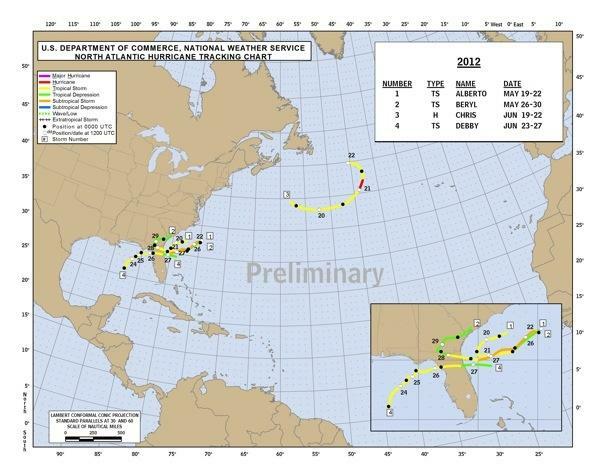 So far in the 2012 season there have been 9 named storms, but none have come anywhere near us. Here is the national weather service map of the storm tracks so far this year. We rely entirely upon the national hurricane center for storm predictions. Usually they are very good and the information is easily accessible online at http://www.nhc.noaa.gov/. The forecast is usually updated twice a day, and more frequently if it appears that the storm is deviating from the track that was previously forecast. We have been checking in on this webpage every morning for the past 3 weeks, and recently there has started to be a lot more activity. 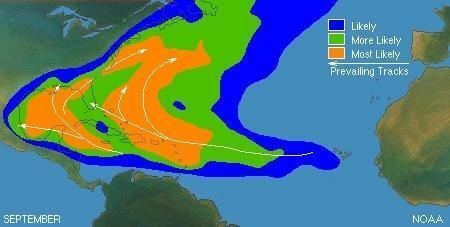 There is a lot of historical data about hurricanes and their tracks available here for anyone who really likes statistics. When we made our cruising plans we made them with hurricane season in mind. We knew that we wanted to be In the Chesapeake bay or farther north until the middle of October. 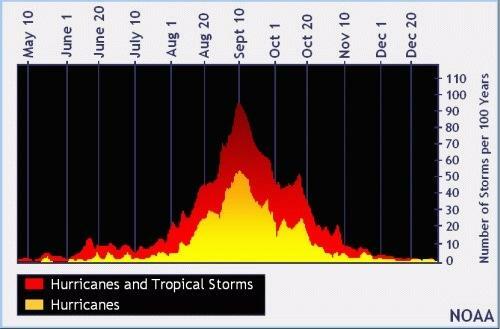 The average “worst” day for hurricanes is September 10th, and then the activity will start to decrease. I am pretty sure they name hurricanes because they develop their own personalities and try their hardest to do the unexpected! 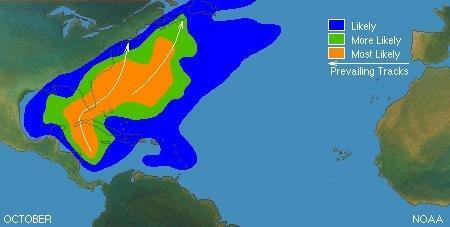 However over time the national hurricane center has also determined what the usual storm paths are. So for being on the northern part of the east coast the tracks of the storms in October are more likely to come our way, but there are way fewer tropical storms. Stephanie and I have not been on Rode Trip for a named storm and we hope that we can continue to avoid this experience. Rode Trip did sit out tropical storm on Mikes mooring in a protected portion of the Piscataqua river in Portsmouth, NH. We headed out before the storm and added extra mooring lines, and drove by in our car to check that everything looked alright. It turned out that Irene went inland before reaching Portsmouth and ended up being a little less dramatic in New Hampshire than the predictions. If we find ourselves in the path of a hurricane this year it will be a much more difficult decision as to what to do. Since we will have several days warning there are several options for hurricane avoidance, in order of severity and expense. 1. If we think that the storm is going to dissipate, or will just effect us without really hitting us then we will probably look for a very good anchorage and sit tight on Rode Trip. 2. If it looks like we are going to be in for a “small” hurricane we will look for a well protected marina with very large moorings, and stay with the boat. 3. If it looks like we are going to be hit with a “medium” hurricane then we will look for a very well protected mooring for Rode Trip, double up the mooring lines, check with our insurance company install an extra bilge pump and find a nice comfy hotel room to sit out the storm in. 4. If it looks like we are going to be hit with a “major” hurricane then we will try to find a marina to pull Rode Trip out of the water, and we can catch a bus to a hotel in a safer location. We are hoping that a little luck o the irish rubbed off on us at the Celtic music festival and we don’t have any named storms heading our way! Today we completed day two of a three day Offshore Emergency Medicine course in Portland, ME. Thus far we’ve learned to not get injured while offshore…and more importantly if there is an injury or illness how to assess and treat appropriately to ensure safety of crew and boat. A cruiser’s definition of an emergency certainly is different then a landlubber’s definition. We are also creating a list of supplies for our emergency kit, and practicing with a few new tools. We’re getting great tips from fellow cruisers in our class. Hopefully we will be able to connect with them in ME this summer. 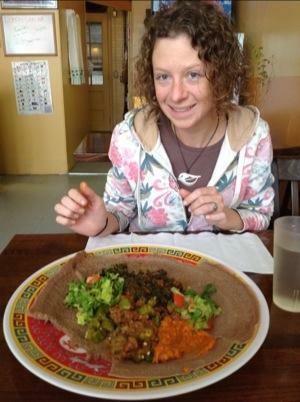 We’re indulging in the foods of Portland, trying local brews and new flavors including Eritrean cuisine. 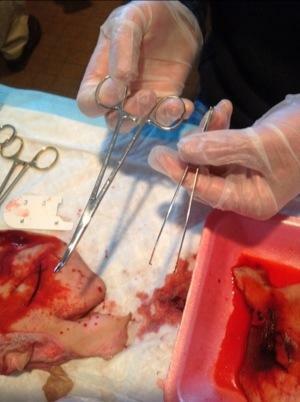 A true learning experience!